Space junk, giant dust motes, magnified cancer cells, Sept. 11 debris, oligarch-worthy spectacle: Whatever Peter Buggenhout’s two enormous, bristling ruins of sculptures bring to mind, they are impressive. Like much of the other art exhibited under this roof, they are also well served by its hygienic white-boxness, except that we might be tiny organisms under a microscope with them. 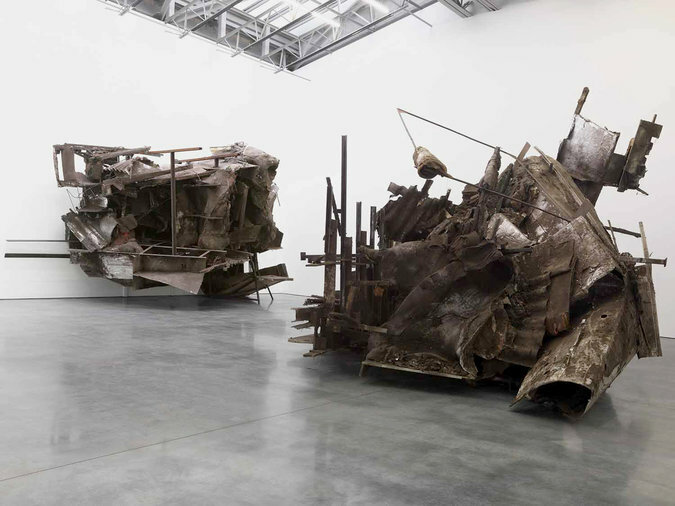 They add to a tradition of junk sculpture that begins with Picasso, but they relate especially to the crushed metal forms of John Chamberlain and Nancy Rubins; they are great chunks of folded space in excess of the volumes they actually occupy. That the works are both titled “The Blind Leading the Blind” gives them an apocalyptic cast and links them flatteringly to a painting by — and, more generally, the down-to-earth art of — the Flemish painter Pieter Bruegel the Elder. These works have found their own way to split the difference between painting and sculpture and between found and made. As you study them, their implicit chaos subsides into deliberate complexity. Their amalgamated forms begin to read as carefully improvised, not random. Their dusty surfaces are ostensibly anonymous, yet delicate, and imply a degree of visual attention not unlike that of paint on canvas. Since they are large and sit on the ground, their interior spaces also feel accessible in ways that those of Chamberlain and Ms. Rubins usually don’t. They imply big, dark, spiraling wormholes, even fuller of catastrophe than our own time and space. These works are Nos. 66 and 67 in a series. Going by these, 67 sounds like a bit too many. There’s also the question of what the artist will do if, and when, the series ends.